The gist of the program is next month, all households are set to receive a new grey bin which will now be used for trash. The current green bins will be retrofitted with a blue lid and will now be your super duper single stream recycling bin. ‘Big Green Can’ barrels currently used for trash will now be used for recycling; larger barrel aims to increase recycling rates by making it easier to recycle. 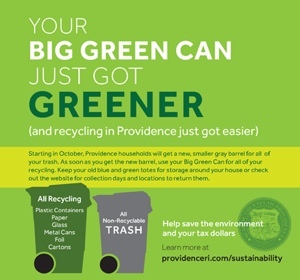 Providence’s Big Green Can is about to get greener and recycling is getting a lot easier in the capital city. Starting October 1 and continuing through the end of the year, every Providence household will receive a new, 65-gallon gray trash barrel. As soon as a gray can is delivered to a household, its large, 95-gallon ‘Big Green Can’ barrel currently used for trash will be used for recycling. Waste Management will replace the lids on the Big Green Cans with a bright blue lid and graphic instructions on the new recycling procedure. The larger recycling barrel, coupled with the statewide transition to single-stream recycling, aims to increase recycling rates by making it easier for all residents to recycle. Residents should begin using their Big Green Can for all recyclables as soon as they get their new gray barrel for other trash. Recyclables don’t need to be sorted – simply put all plastics, paper, glass, metal cans and foil together in the Big Green Can. The city will maintain a “no bin, no barrel” policy for all garbage and recyclables collection: Residents who do not put their Big Green Can out on the curb on their collection day run the risk of not having their other trash picked up. Recyclables put on the curb in the green and blue totes currently used for recycling will also not be collected. Waste Management is transitioning to an automated system and will not collect recycling in the green and blue totes. Residents can keep their old blue and green totes for storage around the house, or return them to the city during tote collection days (information about collection days will be posted at www.ProvidenceRI.com/sustainability). “Waste Management is thrilled to partner with Providence to improve the city’s recycling program, and we are excited to introduce our new cleaner and quieter collection vehicles that will be powered by compressed natural gas,” said Jim Nocella, public sector manager for Waste Management, Inc. Recycling more will not only help keep Providence clean and green; it will also save the city money. For every ton of recyclables residents put into their new Green Cans, the city saves $32. Last year, the City of Providence recycled almost 10,000 tons of material, savings $320,000. Bringing the city’s recycling rate to 25 percent next year would save Providence an additional $250,000. In FY11, Providence’s recycling rate was 14.6 percent – lower than every Rhode Island municipality except Johnston’s 12.2 percent recycling rate. “Providence is making a big leap forward in its efforts to increase recycling and reduce trash. By providing city residents with ample room to recycle, Providence will make good on its promise to bring sustainability to every neighborhood. Residents can feel good that they’re doing their part to keep Providence clean and green,” said Sarah Kite, director of Recycling Services for Rhode Island Resource Recovery Corporation. On Monday, September 24, the city launched a multimedia public education campaign – “Your Big Green Can Just Got Greener” – to raise awareness of the new recycling program. The ad campaign includes eight weeks of bus shelter advertisements, two months of RIPTA bus ads, as many as 850 radio spots over four weeks on five local radio stations, underwriting for Rhode Island Public Radio and Latino Public Radio, print and web ads in local newspapers, and direct mail to all Providence households. The public education campaign is funded with federal money through the Energy Efficiency and Conservation Block Grant managed by the U.S. Department of Energy. This is going to be annoying. I understand the need for the cans so everything can be automated (with those awesome garbage can robot claws). Why switch recyclables to the green bins? Just because they are green? Then you have to put out both recycling and trash every week? My wife and I barely fill up the little bin each week and we recycle everything that can be. Now we are just going to be putting out a huge green can with very little in it? I also feel sorry for all those can pickers. I don’t care that we have another big can for recycling (though I will have to find a new place to keep it). I’m kinda glad about that. It makes getting rid of big broken down boxes easier. The annoying part of this program is that they’re switching cans on us. What’s wrong with just giving us a new can for recycling? Why do we have to switch? What do we do if we’ve already put garbage in the green can? Are we now supposed to empty it? I just noticed that the new grey trash cans are 30 gallons smaller than the green ones. WTF? I know we can recycle a ton of stuff… but the stuff that can’t be recycled tends to be larger. Is the city stupid? I am all for this switch, it will be great to have a larger recycling bin, since the switch to single stream and the increase in acceptable materials mine are constantly overflowing. My question is, will the automated system take into account the fact that cars are often blocking the trashcans on the curb (particularly in the west end and federal hill)? Or will the truck drivers just drive by leaving the trash for the following week? It is the same system currently used for the big green trash cans. Sanitation workers will be able to wheel the bins into position to load into the truck. I have to agree with Jim on this one.. It seems like they’re complicating things unnecessarily.. Why not just use the new grey bins for recycling? Replacing the lids on the existing bins seems like a ridiculous use of money and time. The goal, from the City’s perspective is to maximize recycling. This is of course good for the environment but more importantly, considering the City’s current challenges, it saves the City money. I agree, there will be growing pains in having a smaller bin. I’m concerned about the people who refuse to recycle having over-flowing trash bines and the rest of us having to suffer the smell, filth, and rats on their account. However, when I lived in New York, we had three equally sized bins, one for trash; one for glass, metal, and plastic; and one for paper and cardboard. Meaning, two-thirds of our refuse volume was to be recycling. Everyone in New York had this arrangement. So, it is possible, it is a matter of Providence residents adjusting to recycling. The single stream where everything goes into one bin makes it much easier. Also, many more items than before are now recyclable, you might be surprised of what can be put in the bins now, check it out. I’m all for increasing recycling, but the replacement of the lids on the existing cans just seems wasteful and unnecessary to me.. It seems that the same thing could be accomplished by putting a big decal on the existing lids. Down here we have 90 gallon trash cans picked up 2x weekly and a 55 gallon recycle can picked up 1x weekly. We can go several weeks without putting out our trash, but we rarely can go a week without our recycling being picked up. Ideally, you will have a lot less trash w/ single stream recycling, and a lot more recycling. So, get with the program already.